Sunday, June 11 – with Orquesta La Moderna Tradición at The Seahorse, Sausalito, CA. Afro-Cuban charanga – danzón, cha-cha-cha, and timba-infused guaracha. 5:00 to 9:00 pm. Saturday, August 12 Conjunto Karabalí returns to the San Jose Jazz Festival, San Jose, CA. While I’ve mostly moved on from salsa/Afro-Cuban scene, I occasionally perform with Karabalí, a band comprised of top musicians from the Bay Area Latin and jazz scenes. This is one of those occasions! Join us at 6:30 pm at the salsa stage. 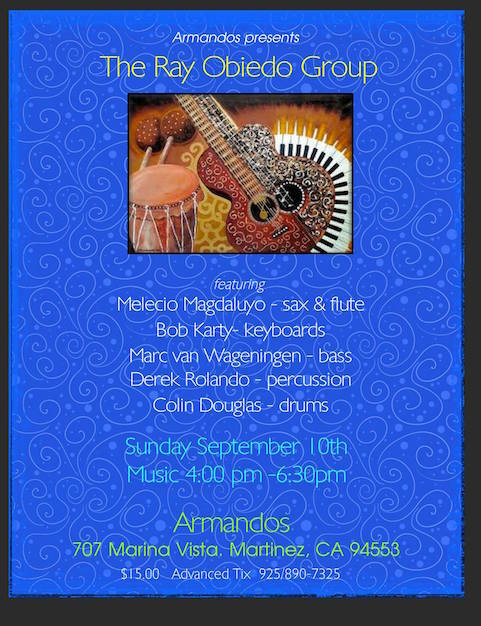 Sunday, September 10 with Ray Obiedo & Friends at Armando’s, Martinez, CA. Latin and Brazilian jazz mixed with East Bay funk, featuring Ray Obiedo – guitar, Melecio Magdaluyo – saxes and flute, Marc Van Wageningen – bass, Colin Douglas – drums, Phil Hawkins – steel pans, and Derek Rolando – percussion. 4:00 – 7:00 pm. Thursday, September 21 – with Pete Escovedo at the Orinda Theater, Orinda, CA. Concert and talk with the celebrated Latin Jazz percussionist and bandleader. 7:30 pm. Saturday, September 23 – with Orquesta La Moderna Tradición Septet at Trader Vic’s, Emeryville, CA. Afro-Cuban charanga – danzón, cha-cha-cha, and timba-infused guaracha. 7:00 pm. Sunday, October 15 – CANCELED due to air quality problems from the Wine Country fires – with Orquesta La Moderna Tradición at Civic Center Park, Berkeley, CA. Traditional and modern Afro-Cuban charanga music. One set starting at 1:00 pm. Sunday, October 22 – with Ray Obiedo & Mistura Fina at Armando’s, Martinez, CA. Brazilian and Latin jazz mixed with East Bay funk, featuring singer Sandy Cressman. With Ray Obiedo – guitar, Alex Murzyn – sax & flute, David Belove – bass, Colin Douglas – drums, and Derek Rolando – percussion. 5 pm. 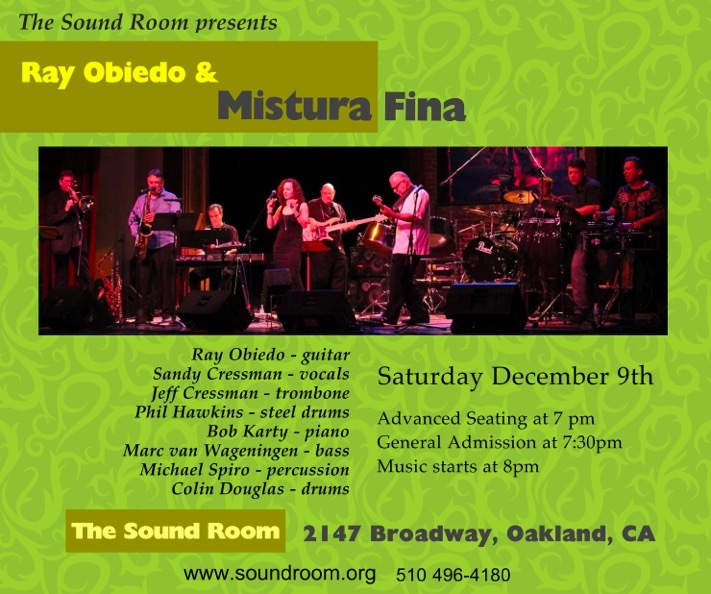 Saturday, December 9 – with Ray Obiedo & Mistura Fina at The Sound Room, Oakland, CA. Brazilian and Latin jazz mixed with East Bay funk, featuring singer Sandy Cressman and guitarist/composer Ray Obiedo. With Marc Van Wageningen – bass, Colin Douglas – drums, Phil Hawkins – steel drums, and Michael Spiro – percussion. 8 pm. Sunday, December 31 – New Year’s Eve at La Peña Cultural Center, Berkeley, with La Moderna Tradición. Show starts at 9 pm.